The morning of the fourth round in the IZOD IndyCar Series in Sao Paulo, Brazil started in having the DW12 IndyCars warm-up in light showers with the drivers finding dryer areas of the track to run and post the best times. When this happens in Sao Paulo, people begin to understand why this part of Brazil is known as the "Land Of Drizzle". Pursuant to Rule 14.14.6.4.1, Cars 4, 6, 7, 18 & 19 will start on Primary Tires. NOTES: Qualifying lap times for the No. 18 Sonny’s BBQ car have been voided by INDYCAR following post-race technical inspection. Pursuant to Rule 14.4.13.3 of the 2012 IZOD IndyCar Series rulebook: As requested by INDYCAR each Car must run either the cameras or dummy equipment as supplied by BSI/INDYCAR. Justin Wilson, who had qualified sixth in the Dale Coyne Racing car, will start from the rear. Unapproved engine changes, which incur 10-grid spot penalties, were made to the No. 15 Rahal Letterman Lanigan Racing car of Takuma Sato (did not participate in qualifying), the No. 7 Dragon Racing car of Sebastien Bourdais (qualified 19th), the No. 22 Lotus DRR car of Oriol Servia (qualified 24th) and the No. 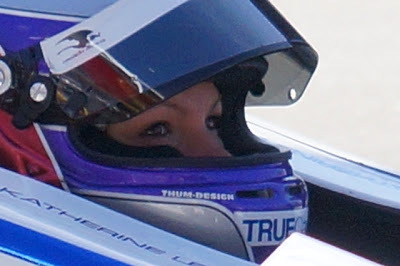 6 TrueCar Dragon Racing car of Katherine Legge (carried over from Long Beach; qualified 25th). Everyone gets off to a great start with Will Power maintaining the first position. 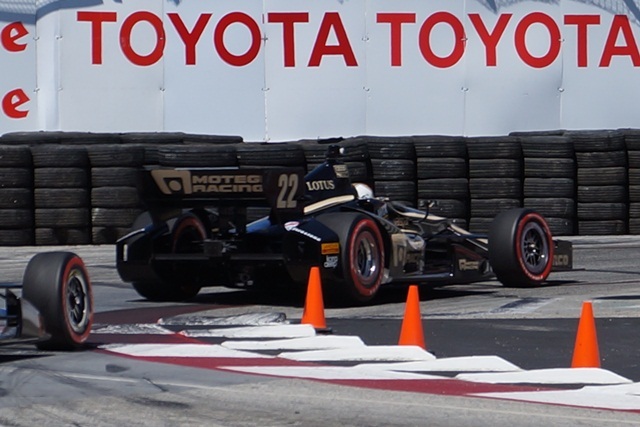 On the first lap, Newgarden and Hinchcliffe battle hard with Newgarden taking the position. End of the first lap saw Conway taking the position from Hinchcliffe and Dario Franchitti staying tight on Will Power's wing. The long, nearly one-mile straight-away featured on this circuit really lets these new DW12's stretch their legs, so much so that during qualifications, Will Power, who won the two previous races here, set a new track record with a lap of 1 minute, 21.4045 seconds at about 3 minutes left in the Firestone Fast Six qualifications round. At Lap 4 of 75 - The engine wars have been invigorated with the change to the turbo design on the Honda engines - the top six positions are Power-Chevy, Franchitti-Honda, Dixon-Honda, Newgarden-Honda, Rahal-Honda, and Conway-Honda! Lap 7 of 75 - AJ Foyt's Mike Conway is all over Sarah Fisher Racing's Josef Newgarden to try at taking away the spot as KVRT's Tony Kanaan passes team-mate Rubens Barrichello. Announcement Note: Bryan Herta Autosport stayed behind from the race in order to prepare for the INDY500. The team has left the Lotus Legion and will be running the Honda engine the rest of the season. Pit Stops begin on Lap 10 of 75. Pagenaud is in early and has an adjustment to his front wing for more downforce. Takuma Sato came into the pits too hot and incurs a drive through penalty ... needs a third wing replacement for the weekend. Lap 13 of 75 - Justin Wilson is one of the big movers starting at the back of the field at P26 up to P18 - Drizzles are beginning to fall so those who waited may be able to have one less stop for rain tires. Marco Andretti in the pits from P14 and takes on Firestone Reds - drops to P25. TWEET - The EDJE @theedje -18 laps. 3 commercial breaks. 1 pre-taped segment. Missed passing and pits tops. Awful. Lap 20 of 75 has Power leading the field by 3.2 seconds ahead of Franchitti, Rahal, Conway, Hunter-Reay, Briscoe, Viso, Barrichello, Carpenter, and the Lotus Dragon Racing of Bourdais. The Lotus and team-mate to Bourdais at Dragon Racing, Katherine Legge, slaps the wall and damages the right rear of the car. A wet spot has Ryan Briscoe bringing out the Yellow Flag while under pressure from Rahal. Full Course Yellow Lap 23 of 75 - Castroneves at P8 is listed as the biggest mover up 10 positions from his start. Lap 25 of 75 - Ryan Briscoe's DW12 is on the flatbed truck and is out of the race - storm clouds are gathering with the winds stepping up a notch. A two stop strategy seems out of the question given the potential of rain and the timing mix of yellows the race is having. GREEN Flag - Lap 26 of 75 Side-By-Side - Franchitti spins in turn #1 as he was tapped by Mike Conway - Franchitti's car is dead - Full Course Caution! The shake-out has Power leading RHR, Dixon, Castroneves, Barrichello, Kanaan, Viso, Hildebrand, Hinchcliffe, and Sato round out the top 10. The cheers are going up around the track as the three favorite sons in the race are Helio-P4, Rubens-P5, and TK-P6 in the top 10. Franchitti is able to get restarted, gets checked out in the pits, and rejoins the field. 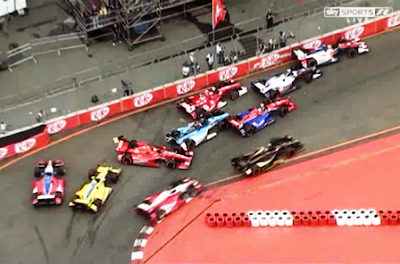 Side-By-Side restart Lap 29 of 75 - Everyone gets through Turn 1 but several cars 4-6 collect themselves in Turn 3.de Silvestro taps Newgarden and causes a blockage - two cars are damaged and in the pits - Newgarden and Jakes. 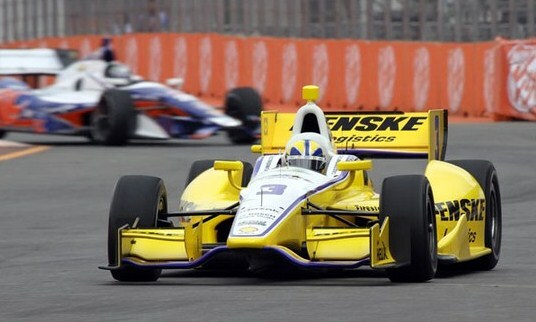 Newgarden rejoins the race - the DW12 is a much stronger and resilient chassis and aero-package. Simona de Silvestro stalled on track. Top six positions are Power, RHR, Dixon, Kanaan, Barrichello, and Viso. A favorite daughter Ana Beatriz occupies P7. GREEN Flag on Lap 33 of 75. Everyone through Turn 1, 2, and 3. RHR is all over the back of Power but the string of cars seems stable. Lap 37 - SeaBass goes off in the run-off area and needs assistance - a rough day for Lotus Dragon Racing. Lap 38 - Crossed Flags signify that this race is official ... no matter what happens from now on, if the race is stopped, it counts. Franchitti is on a charge as Franchitti passed Castroneves for P8. KVRT cars are P4, P5 and P6 (TK, Rubens, and Viso). Lap 40 of 75 - Top 10 are Power (leading all laps) by 1.6 seconds over Ryan Hunter-Reay, Dixon, Kanaan, Rubens, Viso, Beatriz, Franchitti, Helio, and Sato with the biggest move of the day up 15 positions! Tony Kanaan goes to the pits (last stop) so everyone moves up one. Franchitti giving fits to Beatriz and loosess a couple of positions. Castroneves has damage to his front wing but continues on after passing fellow country-person, Beatriz. Franchitti has moved up plus 16 after restarting from the back of the field. Dario now running at P8. Team-mate Scott Dixon in the pits for his assumed last stop. Dreyer and Reinblod's Lotus driven by Servia in for final pit-stop, comes out at P17 ... will be running Chevy for the rest of the season. Sounds like ... sour grapes? Twenty Laps to go - Power by 2.6 seconds over RHR, Franchitti (oh, yes), Castroneves, and Sato. Pit-stops by leaders and Power has a great stop - Power on cold tires as Dixon takes the position away from Power in Turn 11. Franchitti - good stop ... does Dixon need to come in? Hichcliffe and Hildebrand battle with Manica taking the position. Ed Carpenter is running strong in P5 - very good. Everyone is waiting on Dixon to see if he needs to come in. 15 laps to go and Castroneves goes off into runoff area and drops from lead to P7. The pit-stops continue as the order continues to change. Viso in the Pits - Good stop. Dixon has a 2.8 second lead but ... needs a splash of fuel?! Great track action all race long - just great racing all around. Rahal takes P12 away from the Fuzzy's car of Ed Carpenter - big difference between Reds and Primary compound tires. Lap 60 of 75 has Dixon by 3.1 seconds over Power, RHR, Dario, Helio, Rubens, Sato, Manica, Conway, and JR Hildebrand. Carpenter spins - Full course caution - Pits currently closed - All cars on Lap 63 track behind caution car - Pits OPEN! Scott Dixon in ... fuel ... and out in P13 which sets up a RESTART with Power, RHR, Dario Franchitti, and Helio Castroneves on the front two rows - WOW!!!!! This is the 12th consecutive race that Power has led. Newgarden pulls into the pits - broken, out of the race. TWEET - Ivan Renko @Ivan_Renko - Is the IZOD #IndyCar Series called "Formula Indy" in Brazil? I kinda like it. Lap 67 of 75 RESTART - GREEN Flag - Side-By-Side - A bunch of cars get balled up in turn 2 - a ton of chassis are just a mess - Full Course Caution!!! Eight cars involved - Conway hits the wall in Turn 2 as he runs out of room - A call for all of the flatbeds in Sao Paulo to come to the track is put out - RED ALERT In Red Corner! New top 10 are Power, Hunter-Reay, Sato, Franchitti, Castroneves, Hinchcliffe, Hildebrand, Kimball, Viso, and Barrichello. Lap 72 RESTART - GREEN Flag Side-By-Side - Sambadrome turn 1 everyone safely through - Power out positions RHR! Sato in the mix - tracking RHR - Castroneves being chased by Dario Franchitti. Chevy, Chevy, Honda, Chevy, Honda in top five! 2 Laps to go - Will Power looks strong and may only be beaten if he makes a mistake - no drizzles, clear track, Paul Blevin waves the White Flag! Checkered Flag - Will Power Three-Peats the Sambadrome!!! Wins third race on the season - Dixon, nearest in points, drops positions. Will Power jumps off of the front nose of his Verizon Team Penske #12 - in interview says he is happy that it did not really rain on the race all day. 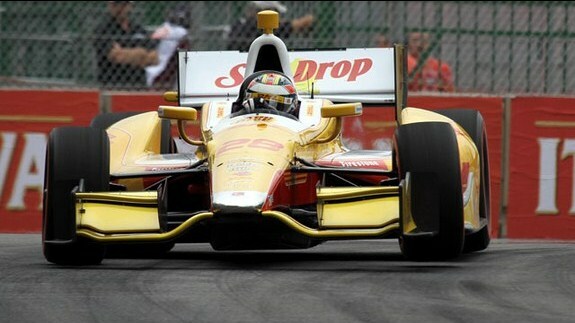 Ryan Hunter-Reay - "Will runs such a clean race. I tried to jump him but he was able to keep the position on the restart." TAKU - "We had a nice race, really - I'm really excited for Rahal Letterman Lanigan Racing - Fantastic. We finally got a good result going into Indianapolis." Helio Castroneves started in P20 and ends up P4 as the highest placing Brazilian! "In the end, Takuma made a kamikaze move and was able to hold until the end. The Twitter, the people were supporting me saying nice things." Engine Wars Update: Chevy, Chevy, Honda, Chevy, Honda, Chevy, Chevy, Honda Chevy, and Chevy ... Lotus just misses out of a top 10 finish with Wix Filter Dreyer and Reibold Racing's Oriol Srevia posting up at P11 in this team's last race for Lotus this season (will be using Chevrolet-power in their DW12 for the balance of the season). 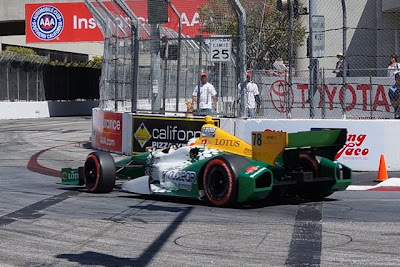 The next closest running Lotus-powered DW12 was McAfee Dragon Racing's Sebastien Bourdais at P18. 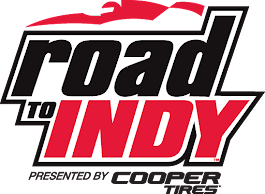 It is now on to the season's first oval race at the "Greatest Spectacle In Racing" with the month of May's INDY500! 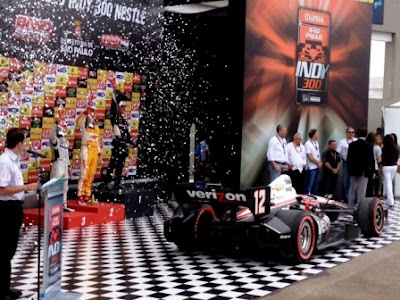 This posting serves to clear the record as to when Verizon Team Penske's Will Power was first able to celebrate his second win on the temporary street course that has served as a race venue, now, for 38 years. Most people think that the celebration would not really begin until the car and driver arrive at Victory Circle where all of the credentialed photographers stake out a good position to capture the action on the provided riser. Today, this was not the case - EVIDENCE HERE. 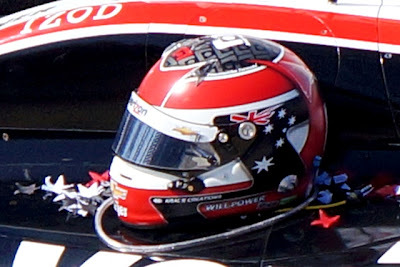 At the end of the race, Helio Castroneves (Penske-Chevy) did a chrome-horn nudge with the front of his DW12 to rear of former F1 driver Rubens Barrichello (KVRT-Chevy) at the apex of the hairpin turn #11. Rubens spun and blocked Helio from going around Rubens car and Helio, in turn, blocked Justin Wilson (Dale Coyne-Honda) and both Helio and Justin ended up being stalled with their cars unable to pass thus shutting down the rest of the straight-away to the Start/Finish line. Penske's Ryan Briscoe, however, was able to sneak through before the orange-suited Holmatro IZOD IndyCar Series Safety Team were able to take over and straighten out the mess in the corner. What happened next is the stuff of footnote legend - Will Power came up to the apex of turn #11 and was completely stopped. Upon recognizing his plight ... and then in a move that showed he could no longer contain his excitement at winning his second Toyota Grand Prix of Long Beach race (after three consecutive pole positions and no win), he unstrapped himself, got out of the car, and shared his celebration with fellow stuck drivers, the crowd in the bleachers closest to the turn, the crews that came out to clear the mess, and the photographers who were tucked in at the "island" apex shooting location. One has to love the back story that not only did Chevy win the race and place a second car on the podium (Andtetti Autosport's James Hinchcliffe - "Mayor of Hinchtown"/"Manica") at P3 ... they took 7 of the top 10 places in the race after being penalized 10 positions to start the race. The closest Chevy on the grid at race start was Penske's Ryan Briscoe at P11. At race end, two Chevy's get together and blocked the track to the final straight that led to the Start/Finish line. One would assume that Beaux Barfield, Director of Race Control had to "call" the race and sort out the finishing order due to the blockage. Myles Regan of Regan Digital Images (regandigitalimages.com), being the professional he is, kept the camera clicking away in gang-shot mode and he shared a file that contains about 140 images or so that are just excellent and capture the whole incident ... even down to Will Power bending over his Verizon Penske Chevy and giving it a kiss through his helmet on the nose cowling that covers the suspension. The Video here shows the images Myles was able to capture in post-race turn #11 which are just priceless. For the second time this month, Will Power came into an IZOD IndyCar Series race expecting nothing more than a top-five finish to secure valuable points in the championship. But with two victories in the young season - starting from ninth at Barber and 12th at Long Beach - the hard-charging Aussie might be changing his outlook. Starting an IndyCar race from the pole position ... of which Power has 10 over the past 20 races, including one this year, might not be the automatic ticket to Victory Circle. Having to start the race from the 12th position in the 38th Toyota Grand Prix of Long Beach on April 15 (due to a 10-grid position penalty assessed to all Chevrolet teams for unapproved engine changes), Power squeezed 31 laps from 18.5 gallons of fuel on the 1.968-mile street circuit while being chased down by former ChampCar World Series team-mate (Team Aussie), Simon Pagenaud, the final 15 laps. Will Power won by 0.8675 of a second. "I could not believe it," said Power, who notched his 17th IZOD IndyCar Series victory. "You always believe that it is possible to win or get on the podium, but it was very unlikely, the fact that it was going to be a two‑stop race. But it was just amazing that Simon did three stops and I did two stops, like two different strategies and the result was similar. There was hardly any time between us as we crossed the finish line. "It's just always a surprise in IndyCar, I think. You can never predict; you can never assume going into a race. You just have to be smart as it plays out. "This was a very sweet victory because I've been on pole here in 2009, '10 and '11, and it just frustrated me that every year something would happen and I couldn't win. Once again this weekend, I'm starting 12th and I felt as though, 'That's impossible to win. I've got another bad year at Long Beach. "But it was just a good race. I pushed hard all the time, no mistakes, great strategy, and just a great team effort again." The team effort has led Will Power and Team Penske to the top of the IZOD IndyCar Series championship standings by 24 points over team-mate Helio Castroneves heading to Sao Paulo, Brazil, where Power has won the past two years running. 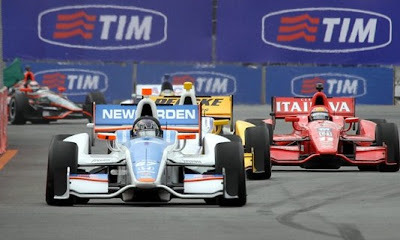 Last year, after not converting the Long Beach pole into a podium (he finished 10th in the third race of the season), Power was seven points to the rear of Dario Franchitti. He wound up second in the standings - by 18 points, which included eight bonus points for a corresponding numbers of pole wins -- for the second consecutive year. Power added that the team effort is spread across the organization, which has swept the three races (Castroneves winning the season opener on the streets of St. Petersburg). The Long Beach IndyCar Series win was Team Penske's first since 2001, when Castroneves prevailed. "I think it's just that they've been probably one of the best prepared with the new car," Power said. "We did a lot of miles (since manufacturer testing began in November). Chevy has worked very hard, and obviously our first hit of the year ‑‑ obviously the 10‑spot grid penalty was a precautionary thing and didn't affect us too badly. "To me, it has been hard work. I think my guys feel very confident no matter where we start now that it's always possible." Some numbers to note following the 38th Toyota Grand Prix of Long Beach, the third of sixteen events planned for the 2012 IZOD IndyCar Series season. 0 - Lotus-powered cars on the podium in the 2012 season. 2 - Wins by Will Power at the Toyota Grand Prix of Long Beach in a turbo-charged car -- one in a CCWS Panoz DP-01 and one in the Chevy-powered DW12. 3 - Drivers who have finished in the top 10 in each of the first three IZOD IndyCar Series events: Will Power, James Hinchcliffe and Simon Pagenaud. 9 - Lead changes in each of the first three race of the season. Percentage points increase in viewership on NBC Sports Network (formally Versus) over the same number of races in 2011. 11 - Positions gained from race start and consecutive races led by Will Power dating to 2011. 11.5 - Average starting position for Will Power in his two wins in 2012. 13 - Positions gained by James Hinchcliffe in securing P3 podium position standing with Simon Pagenaud - P2 and Will Power - P1. 15 - Positions gained by Tony Kanaan and JR Hildebrand in the Toyota Grand Prix of Long Beach, most of any drivers… Positions gained by Kanaan in IZOD IndyCar Series standings by finishing fourth at Long Beach as he advanced from 26th to 11th. 24 - Points separating Will Power (127) and Helio Castroneves in the IZOD IndyCar Series standings. 26 - Laps led by Simon Pagenaud -- nine more laps than he had led in his previous 20 Indy car starts. 184 - Consecutive IndyCar starts for Tony Kanaan dating to the 2001 CART race in Portland. 170,000+ - Fans who attended the Toyota Grand Prix of Long Beach event weekend, according to information released by the Grand Prix Association of Long Beach, the event promoter. WILL POWER (No. 12 Verizon Team Penske Chevrolet, winner Toyota Grand Prix of Long Beach): "It's a great day for the Verizon Team Penske Chevy. We really didn't think it was possible to win from 12th place here because it was a two-stop race, but once again with (strategist) Tim (Cindric), Dave (Faustino), my engineer, and all the boys we overcame a 10-spot penalty." (About Pagenaud bump): "When Pagenaud hit my tire, I thought he should have had a penalty for that. So I was happy beating him because I was kind of angry at him for ruining another one of my races." (About Pagenaud closing in on the lead in the final laps): "They told me (Pagenaud) was coming and that I had a four-second gap and just needed to save as much (fuel) as I could and then I ran hard at the end, the last lap or two, and it was enough." SIMON PAGENAUD (No. 77 Schmidt Hamilton HP Motorsports, finished second): "It was fantastic. The car was great from the beginning. The guys, they did a great job running. We're a one-car team operation, we don't have as much data as Penske or Ganassi, but I'm glad we're giving them a good run for their money. One more lap, man, I would have tried I tell you." JAMES HINCHCLIFFE (No. 27 Team GoDaddy.com Chevrolet, finished third): "The credit has got to go to Firestone. The tires that they bring here are letting us race, and it's mixing things up with different tire strategies. It was certainly exciting from where I was. I hope it was exciting for you guys in the stands, and thanks to all the fans that come out to the race because this is just one of the best events we go to all year bar none. The guys up in the stand were making all the right calls. I don't know, it's something about this race track that treats me well and I've been trying to get this first podium. We start in the front row and it doesn't happen.We start in the second row and it doesn't happen, and after Barber I said to myself, 'I bet $20 bucks my first podium comes in some bizarre circumstance where I start off in the teens,' and sure enough, here you go." RUBENS BARRICHELLO (No. 8 BMC/ Embrase - KV Racing Technology Chevrolet, finished ninth): "Honestly I had a good race today. There were so many yellows the team used a strategy that had me saving fuel. Once we knew we were going to be short, I started to push hard. I would just like people to have more respect for each other on the track. I was hit on every side of my car. .Apart from that, I enjoyed myself today. To start so far back and finish in the top-10 again shows I am getting better and better, so hopefully I will have my best result two weeks from now in Brazil." RYAN BRISCOE (No. 2 Hitachi Team Penske Chevrolet, finished seventh): "We just were stuck in traffic all day long. It's a real shame because I think we had the quickest car out there and we just couldn't do anything with it. We had a bad pit stop, the first one, and that put us way behind and from there we couldn't go anywhere. It was just a really frustrating day." HELIO CASTRONEVES (No. 3 Auto Club Team Penske Chevrolet): "We were just trying to finish and there were two cars in front of me and Rubens, and Rubens was being, I think, a bit cautious and stopped the car and he stopped too much—to the point that I obviously touched him. My intention was never to pass him, but we ended up blocking the track." 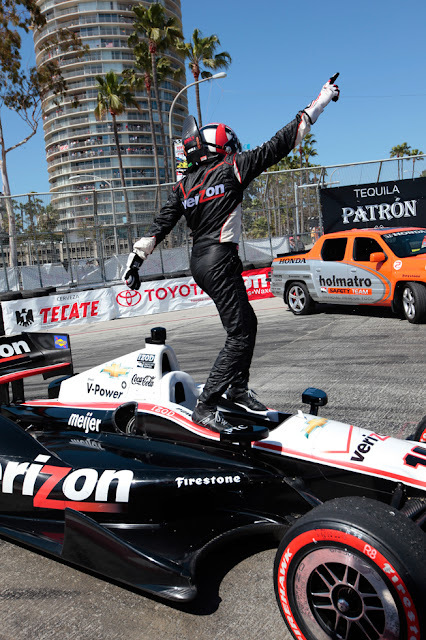 Thank you Helio, for creating (and Myles Regan for capturing) a special unscripted moment to make this 38th edition of the Toyota Grand Prix of Long Beach one of the most entertaining in years ... with a post-race celebration worthy of the event-winning moment. 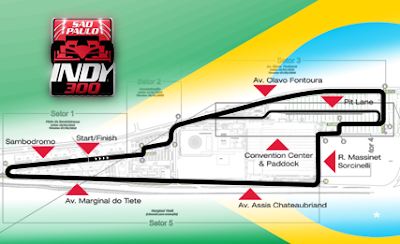 Next weekend catch race #4, the IZOD IndyCar Series Itaipava Sao Paulo Indy 300 presented by Nestle April 29, 2012: Streets of Sao Paulo. The race will be broadcast - on cable - live on NBC Sports Channel (formally Versus) at 11:00AM ET - SiriusXM Satellite Radio on Channel 94 - with Live Timing & Scoring from the web here - http://content.indycar.com/racecontrol - Also, follow the action at Twitter with the #hashtag - #saopauloindy - Sao Paulo Indy 300 (@IndyemSaoPaulo). 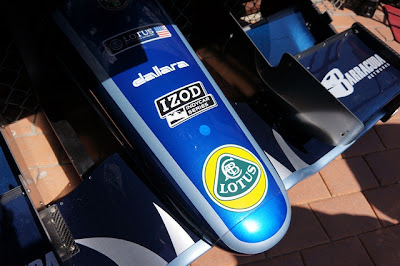 There is trouble in the teams that make up the DW12's outfitted with the Lotus/Judd engine and this real issue may show itself before the crown jewel race of the 2012 season. Marshall Pruett of SPEED.com published an exclusive report highlighting the pressures of a sport that combines technology, competition, and advertising promotion as a history-making business enterprise. Basically two of the four teams are so unhappy with the fact that Lotus, while not missing its commitment to field engines for races this season, has been really behind on the fulfillment of its commitment to meet the competitive demands of the series. 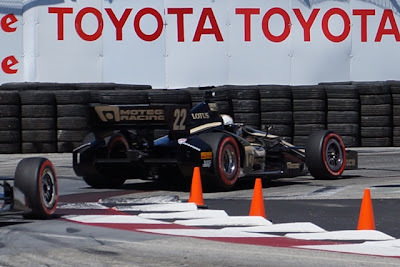 Lotus Dragon Racing (LDR) did not have an engine to mount into one of their two cars (four-time ChampCar World Series Champion, Sebastien Bourdais) before the St. Petersburg race until the very evening before (Thursday) the first practice on Friday. Despite seeing some promising performance in the first two of three races from the four-time ChampCar World Series Champion, the overall performance and the timing of the delivery of engines does not allow any time for testing and this has effected all of the teams that are in the Lotus Legion - Bryan Herta Autosport (BHA), Lotus Dragon Racing (LDR), HVM Racing, and Lotus Dreyer Reinbold Racing (DRR). This becomes a little like one of those what came first situations ... the chicken or the egg. Worse, is this situation even solvable? No timely delivery equals no testing / no testing equals no performance results and feedback / no performance eventually leads to no advertisers to sponsor the car. The main focus is beginning to place pressure on the decisions that need to be made by the series and the business viability of having a Lotus/Judd engine in a car when teams can not be assured of having engines to test and be competitive. Breach of contract filings from the teams in the Lotus Legion are being delivered to the manufacturer - where this goes, no one knows. The IZOD IndyCar Series key person who will have to make a decision, and soon, on what to do next and avert a true mutiny within the Lotus Legion and a potential disaster is Will Phillips, IndyCar’s VP of Technology. Lotus confirms in a SPEED.com exclusive that two of its teams have asked to switch manufacturers, but is it what the series needs and will it be allowed? IndyCar fans have been treated to arguably the three best opening races in series history, but at the back of the grid, a much more serious—and far less pleasant—concern has finally reached its boiling point. With three rounds completed, the bulk of the Lotus-powered teams have been mostly invisible in the final results, experiencing one gut-wrenching problem after another. The conflict between Lotus and its teams reached a fever pitch when the marque informed its entrants that engines would not be made available for the April 4th test at Indianapolis, leaving Bryan Herta Autosport, Dragon Racing, HVM Racing and Lotus DRR in a very awkward position. With the prospect of showing up to Indy next month with zero miles of testing on the Lotus engine around the 2.5-mile oval (not to mention teams starting IndyCar’s most important event with no laps of testing at the Brickyard on their Dallara DW12s), some of its teams have now filed breach of contract paperwork with the manufacturer. A dispute between the manufacturer and those teams regarding the exact wording and obligations in their supply contracts has ensued, but the message being sent is clear: showing up late and unprepared for IndyCar’s Super Bowl is a surefire way to perform poorly, to possibly miss making the show and, when all is said and done, to kiss their sponsors goodbye. Asked what the best-case scenario would be to come out of the breach of contract notices, one owner said receiving permission from the series to switch to a different engine manufacturer was the ultimate goal. Will Phillips, INDYCAR’s VP of Technology, holds the authority to allow said changes, but declined to comment when asked if he would permit any of the Lotus teams to change manufacturers during the season. To give some additional context to that scenario, the two Lotus teams would rather spend an additional $1 million to get a Chevy or Honda engine--which will have an increased engine pool size after Indy--and forfeit the money they’ve already paid to Lotus than to stay with their current supplier. In a half-hour interview just before Sunday's Long Beach Grand Prix, Kotur fired back at a variety of comments, accusations and questions regarding his employers. After informing Kotur that the breach of contract issue was no longer a secret, and that missing the Indy test seemed to be the catalyst—the point of no return for some of his teams--he offered a more credible response. “The teams obviously they complain about this test we haven’t done, but there is some reason--to be able to secure future races, we prefer to keep the engines and to work on them and to continue to develop the engines than to go to this test," he admitted. "Obviously, it would have been better [to be] there, but this is a decision we have made. And if you go through the contracts, there is nothing saying we have to participate in all the tests. If we had been told to be present at this test by INDYCAR because it was mandatory, we would have been present, but it was not. Kotur also offered a blunt assessment of the teams Lotus is partnered with, and although it appears he forgot that Bryan Herta Autosport won its first race of 2011 (the Indy 500 with Dan Wheldon) and was running fourth (with Alex Tagliani at Las Vegas) when the second race was cancelled, the Yugoslavian’s sentiment was no less impactful. Being on the receiving end of complaints from his teams and criticism from the media was an obvious source of frustration for Kotur and his colleagues. With a limited number of engines to offer its teams (eight total powerplants for five cars through Long Beach), engines have been sent back to EDL’s base in England between races for inspection, making it hard for teams to conduct private tests on their own. 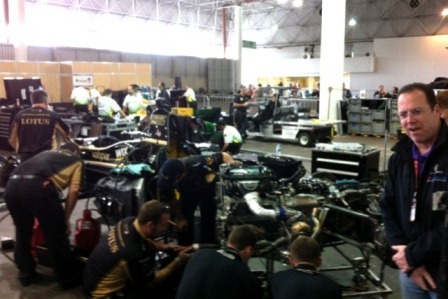 Provided it comes to fruition, Kotur expects Lotus’ engine pool to nearly double next month. To Lotus’ credit, it appears to be interested in appeasing the two disgruntled teams, but it may be a case of too little, too late. With the financial health of the two teams serving as the greatest concern, reducing Lotus’ engine supply burden could actually help the manufacturer to solve its problems and to become more competitive at a faster rate. Stretched painfully thin at the moment, Lotus comes out ahead with a reduced car count, and if Chevy or Honda is capable of adding an extra lease apiece, the two teams can reassure their sponsors that sticking with them—and the series—is a worthwhile venture. On the other hand, Lotus, (at least judging by some of Kotur’s statements and his general demeanor in our interview), seems interested in ramping up its efforts, so maybe it would be better for all involved to stick together. Lotus may have bit off more than it can chew in delivering on a plan for competitive success. As little as this Lotus’ Director of Motorsports Operations, Miodrag Kotur thinks of the driving capabilities of Sebastien Bourdais and Oriol Servia ... the best solution may be a quick decesion by Will Phillips, INDYCAR’s VP of Technology to have Dragon Racing and Dreyer & Reinbold Racing jump to the other engine manufacturers and let the dust settle before the teams meet to engage the process of being in the field of 33 cars to start the “The Greatest Spectacle in Racing”. As it stands, (Lotus) Team Barracuda-BHA and Alex Tagliani have decided to skip competing in Round 4/Brazil citing its recent results, and the desire to prepare to defend its win at the Indy 500. When Lotus entered the 2012 IZOD IndyCar Series, the regulatory requirement to supply multiple teams and the late timing of Lotus’ entry placed a significant restriction on the development programme. It was clear from the start that the 2012 season was going to be a huge challenge as Lotus debuted its IndyCar engine, but it was a challenge that Lotus was determined to meet. Lotus was further hindered by unanticipated difficulties caused by the widely reported change of ownership and the subsequent restrictions on resources. To have achieved a top ten position under these circumstances is pretty impressive. That said, Lotus has acknowledged that whilst the engine has demonstrated a lot of promise, minimal testing has resulted in reliability issues. Having now had the experience and feedback from the first three races of the season, Lotus undertook a strategic review of its position to decide what course of action would be in the best interests of IndyCar and the teams it supports. Following this review, Lotus is pleased to announce in cooperation with IndyCar that, whilst it remains fully committed to IndyCar in the long term, Lotus has taken the decision to reduce the number of cars it runs from five to three for the remainder of the season. As a consequence of this decision, Lotus has made offers to Bryan Herta Autosport LLC and Dreyer & Reinbold Racing LLC to end the agreements with them. Bryan Herta Autosport LLC will not participate in any further races as a Lotus team and Dreyer & Reinbold Racing LLC will race one more time in Brazil next weekend. Going forward, Lotus is excited to be working closely with Lotus HVM Racing, the original partner team and Lotus Dragon Racing, who delivered Lotus’ best result so far this season. Lotus wishes Bryan Herta Autosport LLC and Dreyer & Reinbold LLC the very best of luck for the future. Lotus also intends to continue to assist its engine supplier Engine Developments Limited (EDL) by providing additional resources and financial support to expedite the development program. The details of the arrangement are currently being finalised and the additional support should result in an increased engine performance for the rest of the season. Truthfully … how in the HE-double toothpicks can Lotus say, as they did in the title of their presser, “Lotus Raises IndyCar Commitment” when they greatly reduce the talent (DRR’s Oriol Servia & BHA’s Alex Tagliani) and car count. This action suggests that they are backing away and limiting the chances of sharing testing information with the one very-proven driver they have left – four-time ChampCar World Series Champion (turbo-charged powered engines) Sebastien Bourdais (apologies to Katherine Legge and Simona De Silvestro). Should Lotus-engine supplied IndyCar teams be allowed to jump to Honda or Chevy? Will Power puts together a masterful drive to win from a penalty starting grid position of P12 (due to the changing of engines in all Chevy-powered DW12 race cars) despite winning the pole (P1) position on the grid in the 35th, 36th, and 37th chapters of the Toyota Grand Prix of Long Beach. This victory was Will's second and represents the only victories by a ChampCar Series driver since the merger of the two American open-wheel racing sanctioning bodies of the Indianapolis Racing League (IRL) and the ChampCar World Series (CCWS). The first win posted at this track by Will Power came soon after the announcement that a merger between the IRL and the CCWS was agreed to in 2008, however, since the two series utilized cars from different manufacturers based upon different technical configurations, the 34th Toyota Grand Prix of Long Beach was performed under CCWS sanctioning with CCWS teams and drivers. At the time, Will Power drove for the KV Racing Technology/Craig Gore Aussie Vineyards/Smart & Final-Team Australia in a Panoz DP01 turbo-charged car. 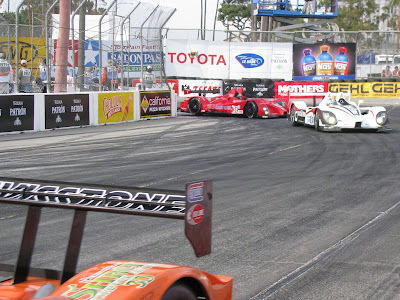 After 452 CART/CCWS races, the Toyota Grand Prix of Long Beach was the last sanctioned race for the series and the Panoz DP01. This 38th Toyota Grand Prix of Long Beach win by Power was in the new formula DW12 chassis car powered by a 2.2 liter, 4 cylinder, turbo-charged Chevrolet engine as it is in its inaugural season ... so one might conclude that with Will Power's win in the new DW12 turbo-charged powered car, American open-wheel racing at Long Beach has come full-circle with Will Power's help. 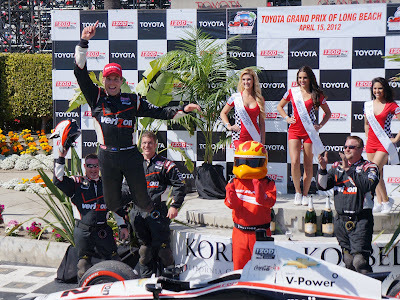 Another interesting connection to the podium in this 2012 Long Beach race is that IZOD IndyCar Series rookie Simon Pagenaud, who finished the 38th Toyota Grand Prix of Long Beach in second place, was also a team-mate to Will Power on the Derrick Walker/Craig Gore Aussie Vineyards-Team Australia CCWS team during his rookie year in 2007. 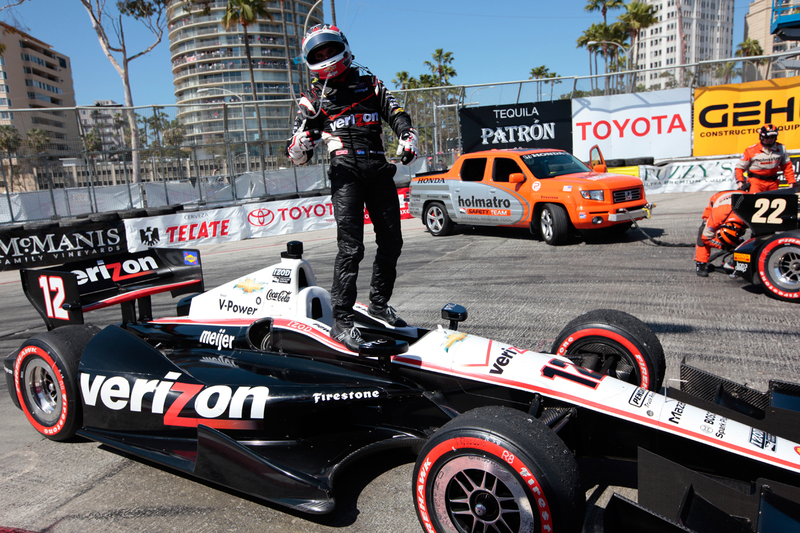 THE MODERATOR: We have now been joined by our race winner Will Power of Team Penske. This is the 17th career win for Will Power, his last win was two weekends ago at Barber. Will's last back‑to‑back victories came in Infineon Baltimore in 2010. This is his second victory at Long Beach. He previously won here at the Champ Car finale in 2008, and this is Penske's first win at Long Beach since 2001. Another great race for you. You said earlier never say never. Talk about overcoming that ten‑grid penalty to win today's race. WILL POWER: I think it came down to a good call in the beginning there to pit, and then obviously we had to save very good fuel throughout the whole race. So yeah, at the end I was very aware of Simon's strategy, especially after he passed Sato, of the gap and the fuel that I needed to get to the end. We saved enough fuel to be able to push for the last two laps, so I felt we were pretty safe. The only thing was the couple of back markers there on the last. That was the only thing that really concerned me. But apart from that it was just running as hard as I possibly could, getting a good lap time with high fuel mileage, and that was the key to the race. Q. Two questions: Number one: How far in the field do you have to start before you won't win? And two, if you could talk about when you did come upon Viso, how much of a concern that was and how difficult it was to get around him? WILL POWER: It was difficult because whoever was in front of him, they almost got together in the hairpin, so when I got a run, it was ‑‑ I got a very slow run. Yeah, it was ‑‑ I mean, yeah, the guy was kind of in the way. I don't think it was deliberate or anything. I'm not sure his team informed him that the leaders were coming. Yeah, what was your first question? Q. How far back do you have to be in the field to not win? WILL POWER: Yeah, pole. If you get on pole you won't win. We've experienced that a number of times here and many other tracks. Q. Under the circumstances of the ten‑spot penalty, how much sweeter if at all is this victory at Long Beach versus the one you had in the 2008 Champ Car finale? WILL POWER: This was a very sweet victory because I've been on pole here I think '09, '10 and '11, and it just frustrated me that every year something would happen and I couldn't win. I thought, oh, once again this weekend I'm starting 12th. I felt as though that's impossible to win. I've got another bad year at Long Beach. Q. Describe this race for you. We're used to seeing you attack if you have to make up positions, but today seemed to be something where you didn't necessarily attack the whole time and kind of played it smart knowing that you had a long distance to travel. WILL POWER: I passed when I could. Every time I could get a run, I passed. I think that was the key to the victory was making those moves on (Takuma) Sato, I think James, I can't remember who else. But that was a key. And on those laps you use a lot of fuel, so then you've got to - Tim (Cindric) is on the radio saying, you must save fuel. You have to use fuel to do that but then save extra to make up for the fuel that you used and get the lap time. So it was just a day of pushing as hard as I could while saving fuel. It was a good race like as far as passing and strategy and everything, again, two weeks in a row. Q. Will, this morning the attitude of your team and yourself going into the race as to what your potential outcome could be, what were your thought processes? WILL POWER: We were thinking top-five would be a very good day for points. That's what we were thinking. You always believe that it is possible to win or get on the podium, but it was very unlikely, the fact that it was going to be a two‑stop race. But it was just amazing that Simon did three stops and I did two stops, like two different strategies. Obviously he could run hard the whole time and not save fuel, and I saved fuel and did the best lap time I could. And the result was very similar. There was hardly any time between us as we crossed the finish line. It's just always a surprise in IndyCar, I think. You can never predict ‑‑ you can never assume going into a race. You just have to be smart as it plays out. Q. Going into the race, how many laps, green flag laps, did you think you could make on a fuel run? WILL POWER: Well, we were thinking 28. All I know, all I ask the team before every race is what lap number, if the radios go out, will I have to pit, if possible, and they said 28. What's two times 28? I don't know, whatever it is. On those laps you have to pit. I try to work that out in my head when the radios go out. What's two times 28? Q. So you got 31, that's pretty impressive. WILL POWER: Yeah, I think my engineer says it was amazing the lap time and fuel mileage I got. He said it was very good. Q. The second question is what did you think of the pits being open immediately not from the standpoint of strategy but in terms of what the pit road looked like relative to open spaces? I know you had the problem with Simon, but basically it's a much cleaner entry and exit. WILL POWER: It is, when you get ‑‑ but sure enough, there was a guy leaving the pit as we were coming in and they sent him right in front of me and then he hit my tire. I was kind of pissed off after that. I asked the team, did he get a penalty, and they said no. I couldn't believe it because I literally stopped for him as he left the pit, and I just knew that would happen, and I just go back to Kentucky when I lost the championship because of that, someone just sends it ‑‑ a team doesn't care, someone is coming and they just send them into you. But this time I preempted it, so I stopped, let him go, and then he hits my tire, so that screws that part ‑‑ makes a massively long stop. But I'm aware in pit lane now of ‑‑ I've lost two championships in pit lane because of things like that, so that's why I'm so keen on not getting in an incident. Q. I believe there was a radio transmission as Simon was catching up to you and Tim said go faster but a little bit faster. How did you calculate that, and what's the danger of just getting involved in a fast lap and using too much fuel? WILL POWER: No, I was very aware of ‑‑ I have a fuel number on my dash, and he gave me a number. I was very good at picking a number and understanding how much ‑‑ I've got so many different levels of speed and fuel that I can do, and I just slowly picked it up and just used a little bit more fuel, went in a bit deeper everywhere. It's just experience of fuel save, and just driving. That's where it's at, you know. Q. About Barber, you thought that was one of the better IndyCar races in a long time. How did you think this one stacked up? WILL POWER: I think just from what I saw there was a lot of passing and some very good passes in front of me. I didn't know what happened to Marco (Andretti). It looked like in front of me there was a big crash. But it looked to me, the cars I passed and the passing that I saw, and even the start, I think Beaux Barfield [IZOD IndyCar Race Director last year's ALMS Race Director, has background in CCWS] did a good job of getting everyone stacked up so it looked like a good start and good restarts, that people weren't going too early. Yes, it was very good racing, again, and I hope it was on TV. I don't know. I can only tell you what I saw. Q. Both at Barber and here, drivers constantly say the tracks were difficult to pass, but at Barber there was passing like there's never been before, there was times they were three wide going through corners which they've never done before. Do you think this new car is making it possible to do things that you haven't been able to do in the past? WILL POWER: I think it's the tires, and maybe the new car is quite draggy so it creates a big hole in the air and allows the car behind to get a good draft. But I think it's Firestone having a tire that ‑‑ between new and old there's a big time difference, and I think they can go more with that. That's definitely what it was in Barber, but here maybe just the draft effect made it a bit better, too. Q. Speaking of the fuel mileage, on the cool down lap you stopped in the hairpin. Were you out of fuel? WILL POWER: No, there was just a big stack up. No one told me to go the back way. Actually I had enough fuel to get around, no problem. Q. The last two years you've come close to winning the championship and something happened at the end and you didn't do it. Do you feel like this might be your year? WILL POWER: After the last two years, I just don't know. But all I know is I'm just going to do my absolute best at every race. Q. You saved a lot of fuel, which allowed you to go quick at the end, but Simon was really, really closing down. How nervous were you in those closing laps with back markers and such? WILL POWER: With three to go I had a four‑second gap or three‑and‑a‑half‑second gap. I wasn't worried because I knew I could at least run under a second from him. I could probably equal his lap time if I pushed really hard. We had saved enough fuel to run really hard for the last two laps if we had to. You know, I think it was at six to go, I had a six‑second gap, so I was very aware all the time. I knew how fast he was. I thought it was about a second a lap quicker, and I knew that we'd saved fuel, so on the last two laps we could push if it came to him being right on me. Q. Penske is perfect on the season, three poles, three race wins. Why do you think that is and what's the mood of the organization? WILL POWER: I think it's just that they've been probably one of the best prepared with the new car. We did a lot of miles. Chevy has worked very hard, and obviously our first hit of the year ‑‑ obviously the ten‑spot grid penalty was a precautionary thing and didn't affect us too badly, obviously. But yeah, to me it was hard work. I think whenever you're winning, the whole team feels very good. I think my guys feel very confident no matter where we start now that it's always possible. I think that's good for them. It's good for all of us. So yes, I think the team mood should be good because if it's not good now, it never will be. THE MODERATOR: We are pleased to be joined by Simon Pagenaud from Schmidt-Hamilton Motorsports. This is a career best finish for Simon, previous best career finish was fourth, which he did three times, Mont Tremblant, Toronto and Edmonton, which is also a best finish for team owner Sam Schmidt in the IZOD IndyCar Series. His previous best finish was with driver Jaques Lazier, which was third in Nashville in 2001. Simon, you certainly put on a show today, reeling in Will there at the end. Walk us through the race in those closing laps. SIMON PAGENAUD: I don't really know until I watch the race to be honest what happened because it seems like it was a pretty cool race to watch. So I'm glad for the fans. I'm glad to be back in Long Beach. It's a place where I've been pretty lucky in the past with two wins in sports cars, so I love coming back here. The Schmidt/Hamilton racing team is just fantastic at the moment. I think we are a one‑car team, but we need to give a lot of credit to Sam and the whole team for putting such a program together. They're the strongest in Indy Lights with five championship wins, and here we are again with second position today in the IndyCar Series. A lot of credit to those boys. HP is a big support for us with my new ride Best Buy, so thanks to them for giving us what we need to fight against Penske and Ganassi. THE MODERATOR: We've also been joined by James Hinchcliffe of Andretti Autosport, James is also having a career best finish today. His career best finish was fourth, which he did several times at St. Pete, Long Beach, New Hampshire and Kentucky. In three starts this season James has yet to finish outside the top six. First podium. Walk us through today's race if you can. JAMES HINCHCLIFFE: I don't know where to start. It was a bit of an eventful race, but man, I know from my seat it was certainly exciting. I bet it was from the outside, too. It's cool to see some exciting racing back in IndyCar. For us, clean start, didn't have the greatest first stint, kind of got held up behind E.J., he was struggling with the balance you could see, but ultimately it came down to the Andretti guys making the best calls on the pit stand. They've been doing that week in and week out this season. It's cool to have such a great team behind you supporting you and making those right decisions because that's what makes IndyCar racing so cool is you can start 16th and still have a crack at this thing if you play the strategy right. Credit to them. 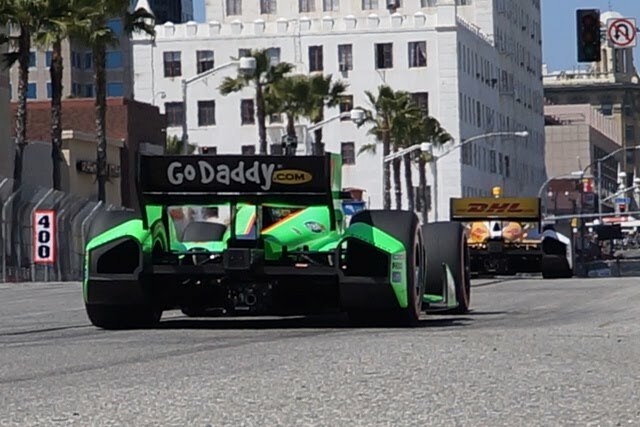 The GoDaddy car was strong right up to the end. I think my fastest lap was the second last lap of the race. Didn't quite have enough to catch Simon and Will, so congrats to them. I do feel bad for Ryan because obviously we finished fourth on track but with Ryan's penalty, and I only got there because of Ryan. He was punching holes left, right and center and I was just following him through for a lot of the race, so big thanks to him as well. Hopefully it's not the last time I get a trophy in this series. THE MODERATOR: What is this we hear about seeing baby face Hinch in two weeks? JAMES HINCHCLIFFE: Well, I may or may not have foolishly made a bet with Wade Cunningham, and the bet was that after my first podium I had to show up to the next race with a completely clean shaven face, and that's not happened since about 2004. So I guess in Brazil you're going to be seeing baby face Hinch show up, and I'm not thrilled about that. Q. Simon, in your mind what was the biggest reason for your success today? SIMON PAGENAUD: Every time he's (Hinchcliffe) around we have a blast. I hope we get to do many podiums together. I think it's mostly my engineer and all the development they are doing is not by himself. He's got a few other engineers working with him, so Ben Bretzman, Nick Snyder and Brendon Cleave, those guys are really close together, and the fact that we're an one‑car team is actually not a bad thing because they're very focused on just my car and very focused on my feedback. So everything I'm asking, I get it. So we just ‑‑ obviously it's taking us a little bit longer than those guys with three cars because we don't have as many data, especially this weekend with less sessions. But when we have a normal weekend, we can actually be with those guys because we have time to catch up. When we don't unload from the truck really well, it's a little bit harder like it has been this weekend, but still, they make good decisions as you can see, and I think it's all about the right decisions at the right time, and I think that's what they're doing. Q. Simon, not to pick on E.J. Viso, could have been any back marker, you had to have mixed emotions when you saw Will come upon him and slow down and then you had to realize you've got to get around him. What went through your mind at those two moments? 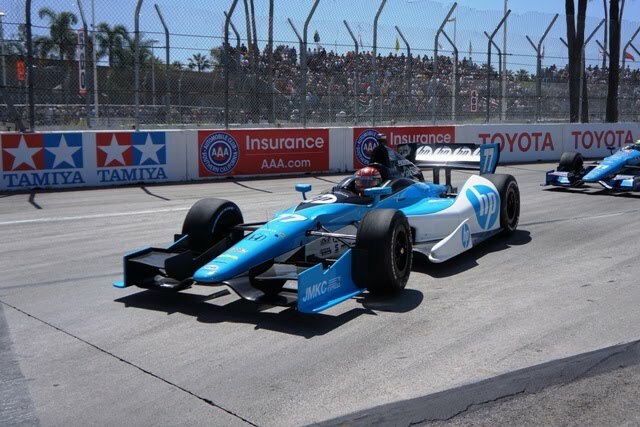 SIMON PAGENAUD: Well, I really thought I would have a go when E.J. was there. I thought E.J. did a good job. He did his best to get out of the way in the right place. There's not much else he could have done, really. I was hoping we was going to end up a little bit more, so it gave me some time, but I just needed one more lap or a little bit more pace. But to be honest, that's all I had, and I think it's plenty quick. But it is what it is; sometimes you can make it happen, and sometimes you don't have the opportunity. But he knows we're coming. Q. Simon, this is along the same lines because I know race control asked the car 5 and 6 to move over for the leaders, and it seems like car 5 took a while, at least a lap before he did so, and I know there aren't too many places around the track, but if he would have done it sooner do you think you could have challenged Will Power? SIMON PAGENAUD: I don't know. With a lot of ifs, you could change the world. It is what it is at the end of the day. I'm really happy with second. If I had an opportunity, I would have definitely tried. You can trust me on that. The day I have the opportunity, I will try. But I didn't have the opportunity, so I don't think I'll go end up (indiscernible) once again badly during the middle of the race, but that's another story. The others I think are doing a pretty good job. Q. Simon, can you clarify for us, your car appeared to have the best view of the first lap incident. Did you think Dario (Franchitti) made the contact with (Josef) Newgarden? SIMON PAGENAUD: That's going to start to be political now. To me it looks like Dario drove him into the wall, but that's just to me. I'm not in his car, I'm not in Josef's car. Again, I need to watch the race and then I could have a clear point of view. I think it's a little bit harsh for me to say what I said. Q. The tire that you struck, was there somebody on your outside when you hit power's tire? SIMON PAGENAUD: Actually, you know what happened, is when I got out of the pits I saw somebody coming in my mirror, so I tried to stay as far as I could on the inside to leave him room, but it was actually Will, but I didn't know it was him. So I did my best to stay on the right to avoid a contact with that car, and I touched the tire. Really sorry about any delay I could have caused him. But it's a tight pit lane. Q. James, you get your first career podium. I'm wondering, are you celebrating it or you sort of got it by something happening in front of you. JAMES HINCHCLIFFE: No, you certainly ‑‑ any competitor wants to earn it. I would have rather have done that pass on the track to get the first podium, to get any podium, to get anything. You don't like being given stuff like that. But at the end of the day, it's a function of racing, and it is what it is. Sometimes those things work for you and sometimes they work against you, so it all sort of balances out, and you just have to take these little things when they come. Q. 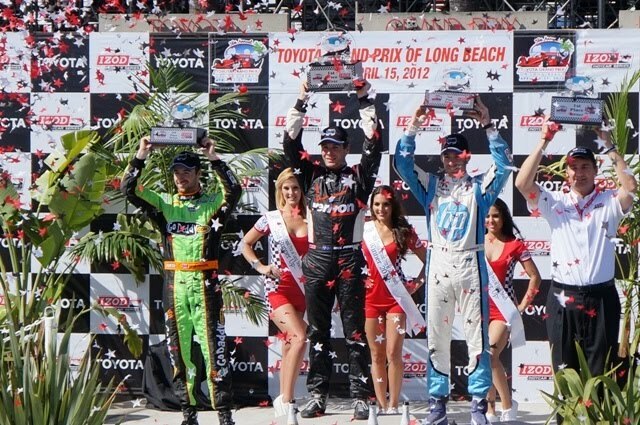 How does Long Beach compare to other races on the circuit? JAMES HINCHCLIFFE: How does it compare? Long Beach is fantastic. I mean, this is a race that everybody looks forward to coming to every single year because it's ‑‑ selfishly from the driver's point of view the track is a lot of fun to drive. It usually produces really good races. And then from the fan point of view, the atmosphere, the environment, everything about this event is just so cool. 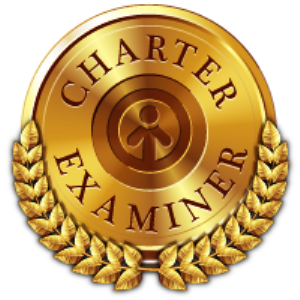 It's been around 37 years now, and there's a reason for that ‑‑ 38 years now, I stand corrected, and there's a reason for that, still. And yeah, it's a favorite among drivers, it's a favorite among fans, and I love coming back here. It's always treated me pretty well. I wished we raced here three or four times a year selfishly. SIMON PAGENAUD: Yeah, it's a great place with a lot of history. It's good to come to California, as well. It changes from Florida where we are all winter long. It's nice to be here, and to me, as well, has been a pretty good track to me. The fans, they show up with ‑‑ it's a pretty big crowd out there. As James said, there's a great atmosphere, great restaurants around, so it's cool for us to come over here. Q. Simon, as the only Honda among the top seven after the penalty, is that kind of demoralizing to see that? SIMON PAGENAUD: No, it's not. I think Honda is doing a great job. I think it's very tight with Chevy. But you know, Chevy has got ‑‑ teams like Penske and Andretti with six cars, so it's quite a bit of cars to beat, and they're very strong as a team. I think it's just the consistencies of the race. I think drafting the Chevy, I don't feel like we're doing. I don't feel like anything is better on their side. I just think it is what it is at the moment. But luck turns around, so we'll see. Q. For both you guys, how did the new rules with keeping the pits open during some of the full course yellows affect your races? SIMON PAGENAUD: Honestly, I don't know again. I need to watch the race. I just came back to the pit as early as possible when they said pit, pit, pit, and I tried to rush into the pit. I think it makes it better for the strategist. It shuffles everything, and you can ‑‑ we initially started to think we would do the race on two stops, and because of that we changed our plan. So I think it makes for good racing. JAMES HINCHCLIFFE: Sort of like Simon said, I don't know exactly ‑‑ that's a tough question to answer without watching the race. But our strategy seemed to change lap by lap. It was pit in five laps, pit in four laps, pit in two laps, pit now. It's sort of a bit of a bouncing ball for us. I think what is cool about this new rule is that it's not a guarantee. Bo has the right or the prerogative to close the pits under a caution if it's a severe enough accident and he doesn't want people at speed trying to catch up or in pit lane. It just throws another element in there, another unknown, and I just think that's great for the racing, spices things up a bit. Q. Simon, at what point after your second stop did your team tell you that you would or would not be able to make it, and did they tell you to go for it at that point because you were pulling out enough of a gap and you needed to close back the gap after your third stop? SIMON PAGENAUD: Well, I asked them at some point where I was because I didn't know what was going on. I was just pushing as hard as I could with what they were saying. At the beginning of the race they said do this fuel mileage and you need to go as fast as you can so I was doing the fuel mileage and once we started thinking about the three‑stop strategy it was clear I had to push and not save fuel. So I pushed as hard as I could at the end when Will was behind me. I realized if he wasn't staying up with me, it's because he was saving fuel, so I knew he was going to the end and I wasn't, so I was trying to open up the gap. I understood, but when the team is just telling me to go as fast as possible, I just go as fast as possible. I don't think that much. Q. Have you ever closed on a leader like that before? SIMON PAGENAUD: I did in 2010. I thought it was a repeat of what happened in MP1 in 2010 when I passed Adrian Fernandez in the last lap. I was hoping he was going to make the same mistake, but he didn't. 85 Laps around the 1.97 mile temporary street course at Long Beach. The margin of victory was less than one-second at .8675 seconds. There were nine lead changes among seven drivers with seven cars on the lead lap. 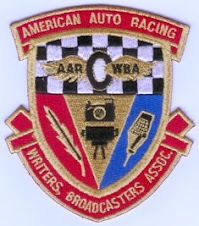 Nineteen DW12's were running on the track out of 26 cars that qualified and started the race with this being the third race ever run with the new DW12 Dallara formula that features Chevrolet, Honda, and Lotus turbo-charged engines. Will Power advanced eleven places to win, Simon Pagenaud advanced two places to grab P2, and James Hinchcliffe advanced thirteen places to stand on the podium in P3! So, no passing? No history? No sense of drama? And, no connections to the glorious past of ChampCar days in Long Beach? If one just holds on and exhibits some patience, Will Power will deliver the full-circle racing experience we have been yearning for since the end of ChampCar World Series style racing in 2008! 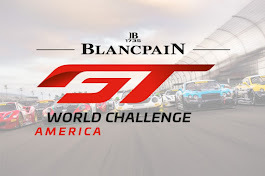 A total of 35 cars racing in five configuration classes - LMP1, LMP2, LMPC, GT, & GTC - are set for the Tequila Patrón American Le Mans Series at Long Beach. 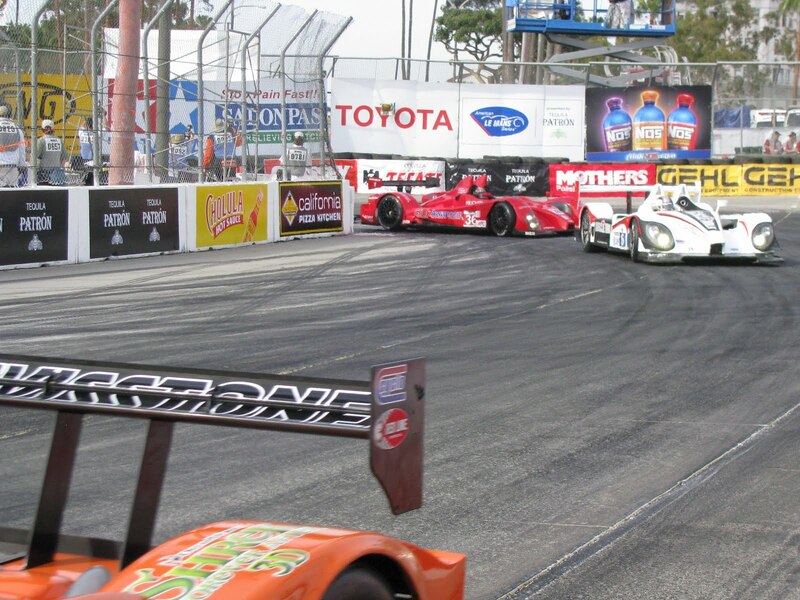 This level of competition ties the 2010 field and represents the largest of any racing field at Long Beach in over 15 years. One of the areas of interest that had the largest growth of teams and competitors for 2012 is the open-cockpit classes of LMP2 (4 cars - up from 2) and LMPC (9 cars - up from 4). Level 5 Motorsports is defending its 2011 LMP2 championship this season and is already off to a strong start. The team won the LMP2 class in the season's first event last month and looks to continue that good fortune at Long Beach, the second event on the schedule. "The competition we will face this season is very strong," Tucker said. "We had a good run at Sebring and showed we have what it takes to win. We're hoping for more success at Long Beach." Someone other than CORE autosport's Gunnar Jeannette will be hoisting the LMPC class winner's trophy late Saturday evening for the simple reason that Jeannette won't be back at the Beach in search of a three-peat. That's not to say his team won't. "Long Beach was my first race ever in the U.S. and when I saw it for the first time I knew it was the Monoco of the U.S. It really opened up my eyes as to how great U.S. racing can be with the combination of venue, course layout and fans, and really bolstered my decision to keep racing in the U.S. I’ve made sure to return to Long Beach whether I was driving or not," said Dalziel. "I have worked with Alex for a long time and it’s always good to be driving with him, especially with a team that is as professional as CORE autosport. My goal is to help Alex learn the ‘tricks’ of Long Beach, which is challenging because it’s quite fast for a street circuit, while helping him gain points and win the championship." "I know Ryan is a good, fast and safe driver," responded team-mate Alex Popow. 'Having Ryan as my co-driver gives me confidence, as I have never raced on the streets of Long Beach before. I know he knows the track really well, definitely knows the car and he has a great relationship with CORE autosport – all good things for success. “With Ryan’s speed and the tips he can give me to be fast and smart on the track, we have a very good shot to stay out of trouble and win the race."